Generation has been selected as one of the 12 finalist projects for the 2018 WISE Awards. Generation is a youth unemployment organization active in 65 cities and eight countries. Operating with more than 1,700 employer partners, Generation empowers young people to build thriving and sustainable careers while providing employers with the highly skilled talent they need. The Generation program trains youth in profession-specific skills, places them in jobs and monitors their performance. It also provides the trainees with social support such as mentorship or alumni programs and monitors participants’ well-being and quality outcomes after their recruitment. Stavros N. Yiannouka, CEO of WISE, said: “We congratulate Generation for making it to the finalist stage. 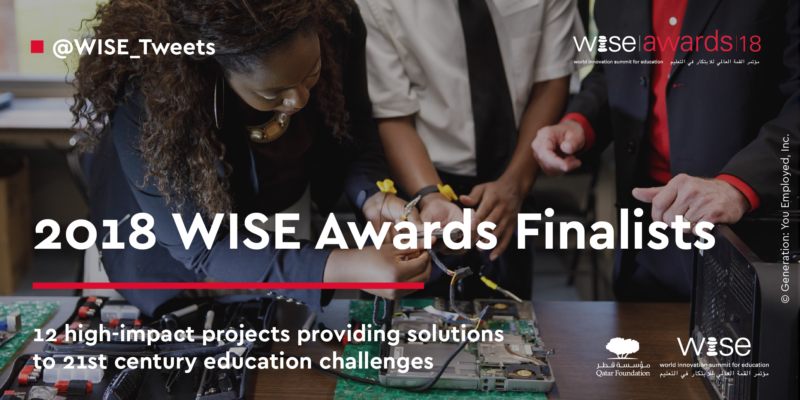 Each of the 2018 WISE Awards finalists has constructed an effective, tested solution to a global educational challenge. Whether it’s ensuring fundamental education for refugees or creating the next generation of empathetic and conscious leaders, each project is already transforming lives, and provides an inspirational model for others to adopt. This is vital to our mission at WISE, which centers around collaboration”. The finalists will be reviewed by a jury of experts and the six WISE Awards winning projects will be announced mid-July 2018 and celebrated at WISE@NewYork Forum in the United States, September 2018. In addition to publicity and networking opportunities, each project receives $20,000 (US).